As top quality bar equipment suppliers, cleaning appliances are a speciality of ours! 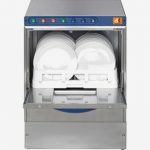 Our range of dishwashers are a fantastic way to ensure you can maintain a top cleaning capacity even on a busy day, as they can take a full load of 18 plates and easily provide a consistent, powerful wash for both. Even if they have to deal with a constant, heavy and thorough stream of the dirtiest dishes to wash, you’re guaranteed a sparkling clean result after just 2 or 4 minutes. 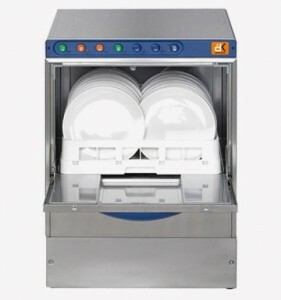 Say goodbye to stubborn stains and dried food when you buy from DK Services, bar equipment suppliers, as all of our dishwashing products are designed for flawlessly effective and rapid work no matter what. Our glasswashers work to much the same standard, too, providing a powerful cleaning appliance which works incredibly well for such a compact package. Able to stand alone or be fitting underneath the counter, you’ll find that there’s no better choice of product from our bar equipment suppliers if you’re looking for something to help relieve the burden of having to wash a large number of glasses and more on a busy day. What’s more, whether you opt in for our range of glasswashers, dishwashers, or perhaps even both, you’ll no doubt be happy to discover that there are no electronics utilised in our incredible high performance appliances. This might seem like a bit of a disadvantage at first, but when you consider that you’ll be experiencing no loss in quality whatsoever for a much more cost effective machine which is easy to service, the choice should be pretty clear. Don’t wait to take a look through our stock to discover why so many people choose us to be their number one bar equipment suppliers! 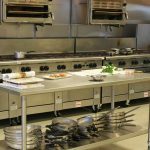 We here at DK Services are bar equipment suppliers who know exactly how to guarantee top standards of success, no matter what it is you need from us or how you choose to purchase it. Whether you’re aiming to buy our incredible bar equipment outright or our innovative rental service has taken your fancy, make sure you get in contact as soon as you can! DK Services is a Bar Equipment Supplier, dealing in Glasswashers, Commercial Dishwashers, Ice Makers and Bottle Coolers. We can offer outright sale or rental on a wide range of machines, models and makes. This is backed with excellent service meaning first time fix is over 90%. What Services Should Bar Equipment Suppliers Provide?